Soak chilly powder, coriander powder and salt in a cup. Heat 3 tsp of oil in a non stick pan. Add fenugreek seeds and stir till they become dark brown. Add garlic and stir for 2 minutes. Add onions and stir again. Add chopped tomatoes and stir fry. After 5-6 minutes, put the soaked paste. Reduce the flame and stir well for 5-10 minutes so that everything gets mixed well and oil gets separated. Add 3-4 cups of water, stir and boil it. When it starts to boil, slip in the fish pieces along with the kukum star. 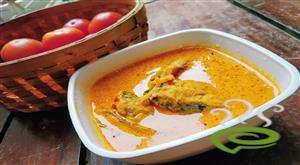 After 10-15 minutes, the gravy will thicken to a dark brown colour and the fish will get cooked as well. 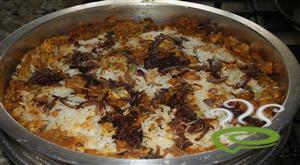 :- Serve the dish after 1-2 minutes. I tried this recipe for the first time and it came out really well. Everyone just loved it! 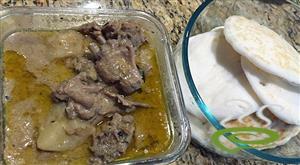 Thanks Anoop, for sharing such a wonderful recipe and keep posting more of them. 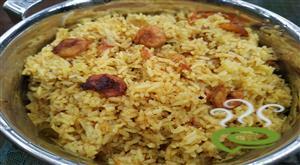 This is a very nice nadan recipe. 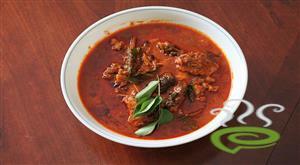 I am a non malayalee and was keen on trying out this recipe. It turned out fantastic. Thank you very much. This curry was tasty. As per another comment I added chopped ginger and turmeric powder too. Try to use softer fish like Tilapia or salmon instead of shark or Sword fish(i used this) also reduce the quantity of onions suggested in the ingredients. Shallots tasted excellent in this curry. I WOULD DEFENITELY MAKE THIS AGAIN! Excellent recipe. My wife and I tried it and it turned out very well. 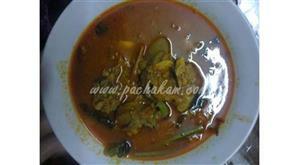 We used to make the usual fish curry with coconut. This curry tastes the same, but feels a bit more healthy as it does not contain coconut!!!! I made this curry today but I Just used one tomato and 1 onion and the curry came out real well. 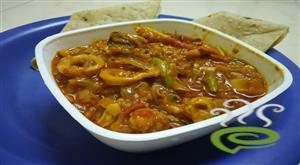 I think one can avoid so mny onions n tomatoes and still make the curry vry tasty. thanks a lot for this great recipe. excellent recipe. thanks a lot. This is excellent and easy to make. !!!!!!!!!!!!Super!!!!!!!!. 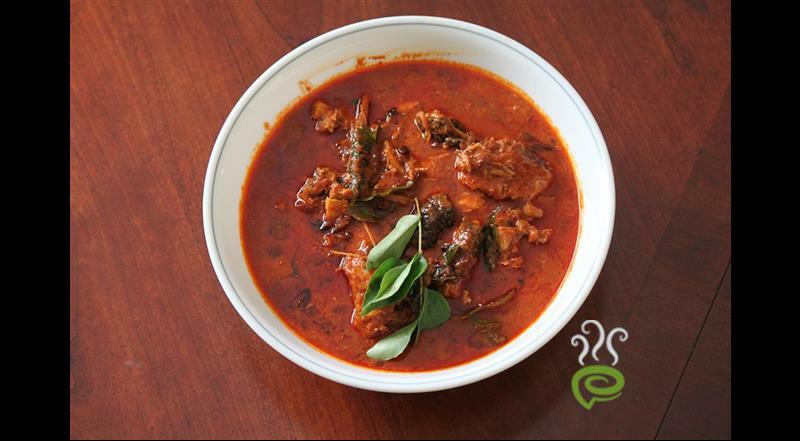 We made this recipe with Vala and Valathala (Kerala Cat Fish, Kozhencherrykarku Ariyam). I was tempted to add some ginger, but finally decided against it. 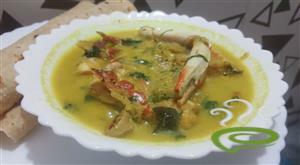 This was really like the Shappu fish curry (Valathala Curry). Very Tasty. I tried this recipe and it was great. Thanks for this wonderful recipe. It`s very yummy. I Have just started learning to cook and i surprised my husband by preparing this fish curry.It was tasting excellent.Thanks Anoop. Hai seline, Dhanya powder is nothing but coriander powder. 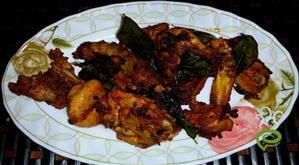 I`m the person who never add tomatoes to the fish dish.... but Anoop i tried ur dish...t`was really too good and tasty...Thanx buddy!! !Keep it up..come up with new dishes..
Hi Tom, Sorry about deleting your comment. The reason for deleting your comments was, majority said, it is a very good recipe. Moreover I personally tried this recipe and it was really good. 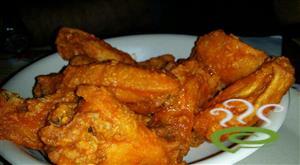 We should appreciate Anoop for sharing this recipe with us. Thanks Anoop. Usually i do not delete bad comments, so that people can decide whether to go for it or not. Yea I do agree with you.In fact I have been cooking this same thing since last 4 yrs and its good.My comments was just lil fun. nevertheless I did made some point though-tamarind is not what "kudampuli" is. KUdampuli is infact cocum and not tamarind But the amazing thing abt this site is that someone is indeed monitoring whats going on. Please give the menu for a dinner for 15 people. Very tasty. And easy to make.